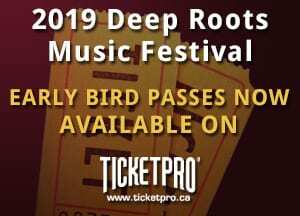 Deep Roots sends out a regular email newsletter to keep people in the loop around both Deep Roots Music Cooperative and Deep Roots Music Festival happenings. Usually, the newsletter goes out mid month. The copy deadline is 5:00 pm on the 15th of the month. Don’t miss out on the latest…CLICK HERE to subscribe to our newsletter to have it delivered direct to your mailbox!